We at SriLankaImporter.com track every shipment, which leaves from Sri Lanka via sea, air or road and start receiving shipment details from our reliable sources. As a result, we quickly update our database with the most current export customs data of Sri Lanka and we are able to provide you genuine export shipment records. We have a dedicated team of database specialists who analyse complete import report of Sri Lanka in order to provide you error-free Sri Lanka export data. In addition to this, our data specialists create business intelligence reports from shipment records that are beneficial for you to take effective and competitive business decisions. At SriLankaImporter.com, you can search for samples of customs data of Sri Lanka exports through HS Classification, Product Description or a combination of both. From our comprehensive and up-to-date database, we are able to answer your trade questions including Who is Exporting, What is the Value of Shipment, From Which Port, Product is Exporting and so on. So, whatever you require in export report of Sri Lanka, it is available at our most trusted and tech-based platform. In nutshell, we cover all data fields including Suppliers List in our export data of Sri Lanka that are listed on your right. 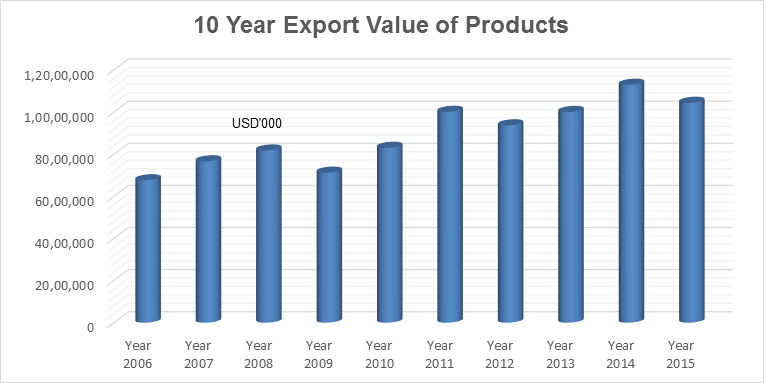 If we look into export statistics of Sri Lanka of last 10 years, we found that the country’s export value of total products increased from 2006 to 2008 and declined thereafter. After that, it recorded a rise in export figures for two consecutive years. From 2012 to 2015, Sri Lanka recorded almost similar export value of total products. As per customs export data of Sri Lanka, apparel and clothing accessories under chapter 61 and 62 stood as the largest export products in 2015, followed by coffee and rubber. 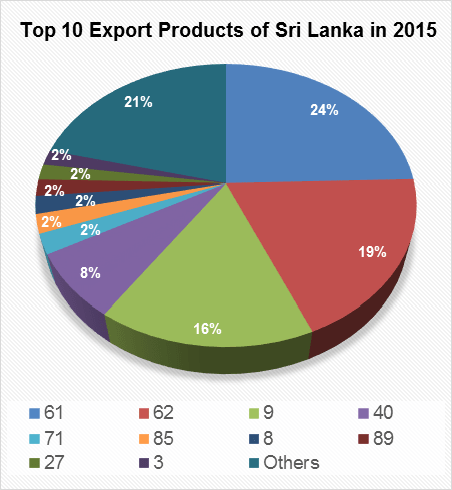 See chart and table below for accessing trade figures of top 10 export products of Sri Lanka recorded in 2015. As Sri Lanka export data and report, the country did maximum export business with United States of America in 2015. Its total share in all trading countries stood at 26.8%, followed by 9.8% and 6.8% of the United Kingdom and India respectively. 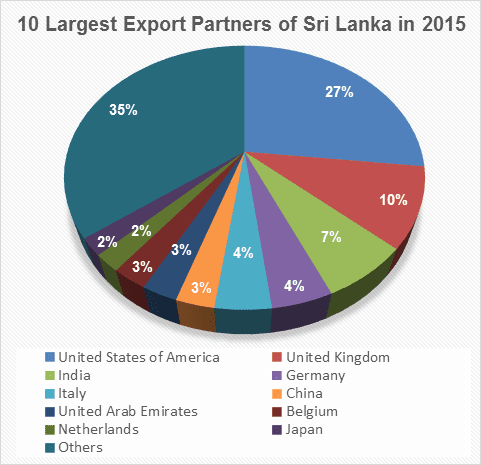 See chart and table to have trade statistics of 10 largest export partners of Sri Lanka recorded in 2015. Our Sri Lanka export data is compiled with customs shipment details including exporter name, origin & destination of shipment and value of shipment. Here are four samples on chapter 61, 62, 80 and 64 that will make you understand how we provide export customs data of Sri Lanka. How Our Export Shipment Data of Sri Lanka is Beneficial? We at SriLankaImporter.com help importers, exporters and business people to make positive and effective business decisions while importing products from Sri Lanka market through our accurate customs export data of Sri Lanka. How? Find out here. For buying commodities from Sri Lanka market, it is important to do business with genuine sellers for having long-lasting relationships. Our shipment records provides genuine suppliers list of Sri Lanka only. For always being ahead in the competitive market, it is important to know the business strategies of your competitors, which can easily be possible by tracking their shipment through our export customs data of Sri Lanka. For having new customers, it is important to have a wider picture of Sri Lanka market. Through our business intelligence reports, driven by Sri Lanka export data, you will easily be able to analyse the market of Sri Lanka including demand & supply of commodities. For making savings, it is important to get market research services from an affordable source. So, buy our export shipment data of Sri Lanka along with shipment details at a competitive price. Colombo/Katunayake and Colombo Harbor is the busiest and biggest international airport and sea port of Sri Lanka respectively. Here is the list of major ports of Sri Lanka from where exporting of commodities takes place. Here is the list of products on which people mostly used to find customs export data of Sri Lanka. So, select the product of your choice and get the sample right away.